TENMAT Firefly 108 Cable Basket Fire Sleeves are an intumescent solution providing fire and acoustic protection to cable baskets or trays when penetrating fire rated walls or floors. The FF108 Cable Basket Sleeves are ready to install providing a quick and easy solution without the need for foams, sealants or pillows. 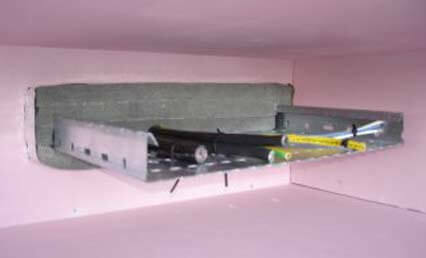 The compressible and fully intumescent material provides an effective fire and acoustic seal around both the cables and the cable tray or basket itself. The FF108 Cable Basket Sleeves are available for all common tray/basket sizes from 50mm up to 450mm and have been fire tested both with and without cables. – Cable Basket Fire Sleeves are available to suit all common sizes of Cable Tray or Cable Basket widths ranging from 50 mm up to 450 mm and for heights up to 54 mm. – For alternative sizes please contact TENMAT.